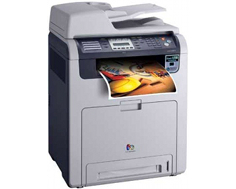 The Samsung CLX-6210FX is a multifunction color laser printer that incorporates printing, scanning, copying and faxing into one rather large package. This model was designed for business use and the best fit for this unit seems to be offices with dedicated floor space. The many available functions and features can replace thousands of dollars of office equipment, making this unit a relatively cost effective and economical office solution, despite an unnecessarily large dimensional footprint, marginal speed and less than ideal quality. 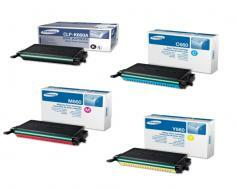 The Samsung CLX-6210FX boasts print speeds of up to 21 pages per minute for both black and white and color output. First page out time is an average of 25 seconds for black and white prints and about 28 seconds for color prints. Print resolutions are achievable up to 2,400 x 600 dots per inch for quality text document reproduction, and built-in duplexing capabilities make it possible to print, copy and scan on both sides of a page with ease and convenience. Document zoom rates are 25 to 400% for the platen and 25 to 100% for the automatic document feeder. Multi-copy quantities can be set at a maximum of 99 and features such as ID copy, clone copy, N-up copy and poster copy provide a business with many conveniences that are not available with most standard copy machines. The color flatbed scanner has a maximum optical resolution of 1,200 x 600 dots per inch, which can be enhanced up to 4,800 x 4,800 dots per inch utilizing bundled drivers and software management tools. Scans can be transferred to hard copy, USB, SMB, FTP, network or email. A built-in fax module comes with a G3 compatible 33.6 Kbps fax modem. 4 MB of page memory is standard and additional features include auto dial, color fax and PC fax. The standard input tray capacity is 350 sheets, divided between a 250 sheet cassette and a 100 sheet multi-purpose feeder tray. An additional 250 sheet cassette can be purchased, allowing for a maximum paper input capacity of 600 sheets. A two line LCD interface provides console print job management without the need of a PC for most of this model's features. Many dedicated buttons are provided for executing specific job functions. 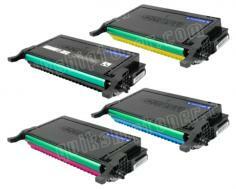 Standard printer RAM is 128 MB and is upgradeable to a maximum of 384 MB. The Samsung CLX-6210FX is Windows, Linux and Mac OS X compatible, providing connectivity to a wider range of computers and configurations. Standard, built-in connection interfaces include USB 2.0, Ethernet 10/100Base-TX and USB host 2.0 for flash drive connections. Other purchasable upgrade options include a 802.11 Wi-Fi card for connection to laptops and PDA's and a 80 GB hard drive for storage of print jobs and documents for easy access at later dates. Print speeds are considered marginal, even for all-in-one units such as these. Monochrome text documents often come out light. A built-in feature called “Print All Text To Darken” is designed to address this issue, but ends up making certain letters bold and rendering documents unusable. Color printing is often in poor quality and there are usually alignment issues, also addressed by built-in features that don't often fully correct the problems, leaving color coverage inconsistent. Control panel features are difficult to utilize and the interface is not very user friendly. Many of the dedicated function buttons that are designed to make certain features convenient to use can often cause confusion, botched print jobs and loss of productivity. The maximum 600 sheet input capacity is very low for such a unit of this size that is designed to handle larger volume print jobs. The large housing and mechanism make poor and inefficient use of space. Review it: "Samsung CLX-6210FX "
The Samsung CLX-6210FX ships with starter toner cartridges that have an average yield capacity of 2,500 pages for black and 2,000 pages for color that is provided by cyan, magenta and yellow cartridges. 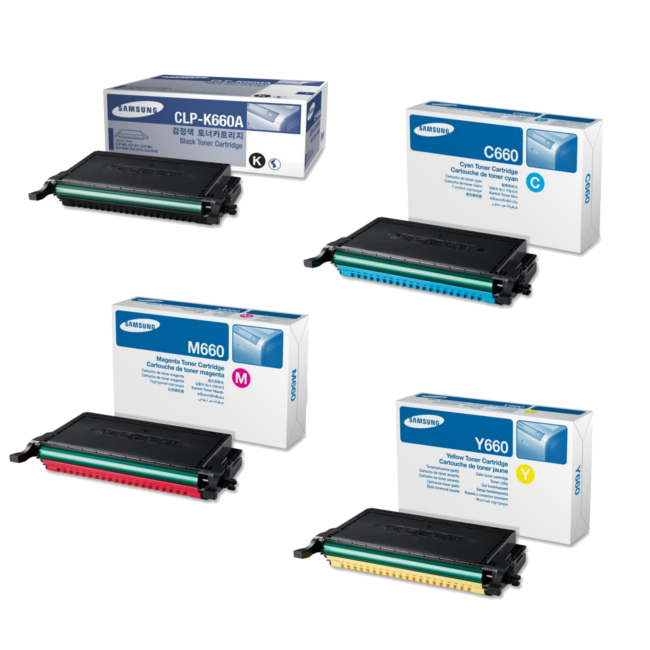 Replacement cartridges can be purchased with the same capacities or high yield cartridges are also available, which hold an average capacity of 5,500 standard pages for black and white printing and 5,000 pages for color.